Dermarolling / Microneedling / Re: Is Single needling/Single liner roller recommended for me? >intensive treatment on individual marks for once. Yes. If you do not manage in four weeks, never mind. It is not important. When you finish, wait one week and start the entire cycle again. I recommend you a 1.5 mm dermastamp with 35 needles. You do not have to stamp every single line of stretch marks. Just do your best and stamp what you can. You can also concentrate on just certain areas with a dermastamp and use just a dermaroller on the others. 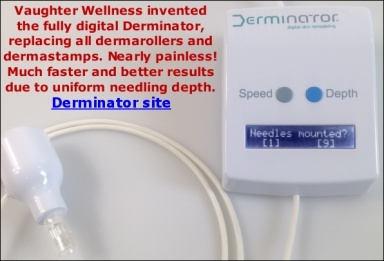 Soon we will sell an electric needling device (Dermajet) with five adjustable needle lengths. This would make your treatments much easier and quicker and it is very suitable for those who have many stretch marks but it is quite expensive (249 dollars). A manual dermastamp does exactly the same job but you are the power behind it (not electricity) so it takes longer. Yes, this is tricky. For the time being, use only your dermaroller. If you are currently stable in weight but you significantly fluctuated in weight in the recent past, it can be a result of that recent fluctuation. The fibers overstretched and it took some time to be noticeable on the surface. Stretch marks often appear after oral or prolonged topical corticosteroid medication. Cushing's syndrome (the body produces excess amounts of the hormone cortisol) and Marfan syndrome, both very rare, cause excessive stretch marks. "Cortisol plays an important role in curtailing the healing process -- higher cortisol levels can lead to a slowdown in healing." ..and hopefully your GP will advice you on what to do more. You can do it as you suggested. You can also use your 0.5 mm dermaroller (up to three times a week) in between your stamping sessions but the more is not always the better. If the skin stays red for a long time after dermarolling, roll for example only once a week or even less. Do not buy the 1.5 mm dermastamp now. Scars are sometimes tethered to the underlying structures. During the formation of a scar, everything is "glued together" by scar tissue. Later, during the maturation of the scar, the part of scar tissue that connects it to the underlying structures should be reabsorbed and the scar should be "freed" but it does not always happen. The rolling type of acne scars are typically tethered to the underlying structures and that keeps them indented. Other type of acne scars are not typically tethered but if the scars are "stubborn" and they won't improve for months on end in spite of various treatments, it is always worth trying different approaches and even include the suction pump. Sorry for the delayed answer, I overlooked your posting since I did not expect it. I do not feel comfortable to recommend dermaneedling for a five year old because it is painful but if you use the shortest needles, it may be bearable. You do not have to pre-treat her skin in any way so ignore the instructions in our dermarolling instructions. All you need to do is to stamp the scar and keep it moisturized after stamping. Buy our 0.5 mm dermastamp (not a dermaroller) and stamp the scars twice a week. It will soften the scar, crush the hardened collagen bundles, enable migration of melanocytes (skin cells that produce skin pigment melanin) from the surrounding skin into the scar and hopefully it will also trigger the formation of new melanocytes in the scar. Melanin pigment is normally present in the skin but its production increases upon sun exposure. Melanin is our natural UV filter that protects us from DNA damage caused by UV radiation, which is why we get tanned upon sun exposure. The body increases its natural UV filter (pigment melanin) in the skin. The darker the skin, the better it is protected. (Melanin is also present in the iris of the eyes. Blue eyes have a layer of melanin in the back layer of the iris. Brown eyes have a layer of Melanin in the back and also in the front layer of the iris and they are better protected from the UV. Hair also contains Melanin (two types of Melanin, in fact and their levels and ratio results in a blonde, red, brown or black color). The Melanin content of hair decreases with age. Grey hair has a low Melanin level and white hair has no Melanin at all. Albinism is the disorder of having no or almost no Melanin). In order to get color in hypopigmentations, you must expose them to the sun. Do not expose it when the scars are freshly stamped but expose it a few days later. If you manage, apply sunscreen to her face and forehead but do not apply any to the scars. If dermastamping and sun exposure will not significantly help in six months, buy a NB-UVB lamp (a handheld device) and target just the scars. Cover the forehead for example with aluminium foil and make two holes exactly the size of the scars to target them with the lamp. You must protect her eyes. Using the lamp is a bit tricky because you have to get it just right to avoid making it darker than the surrounding skin but if you do make it darker, it will fade, just like any other tanning. Treating the scar for months with a dermastamp prior to the lamp exposure is very suitable because it will smooth out the surface of the scar and make completely even tanning more likely. Often, dermastamping itself improves not only the texture of the scar but the color as well. I can imagine how depressing this is for you.. Her skin also very rapidly deteriorated, without any obvious cause. Since I realized that the rapid deterioration of the skin can be a serious unidentified skin disorder (of infectious etiology perhaps) and unfortunately, the dermatologists consulted have no idea what it is, I do not recommend any form of dermaneedling in this case. As much as I would like to help you, I really do not know what it is. The only thing I would recommend is to visit as many various dermatologists as you can and maybe one of them will guess it right. Please let us know the results of your quest for a diagnosis. Unfortunately, Birdsing was only a registered member on our previous forum before we migrated from vBulletin to SMF so I do not know her email and cannot ask her. What did your dermatologist say it is? I rescaled your photos, making it easier to see the scars. In your case, it is wiser to stamp scars on one cheek (but very thoroughly and densely) during one session. When it heals, stamp the other cheek. If your scars get better with dermastamping, add a regular 1.5 mm dermaroller to your sessions. It seems that some of your scars can be tethered. In some months you can add our suction pump and suction the scars after dermastamping. 1) No, we do not hear many complaints about such discomfort lasting for days but this is individual and it also depends where the stretch marks are. You can solve it by treating small parts of the skin during one session and when it heals, treat the other etc. The same with single needling or stamping. You can needle or stamp for example five stretch marks a day or every second day. Each stretch mark on your body should be needled or stamped only once a month, so every time you treat your stretch marks during one month, treat different once. The skin will get used to dermarolling and your discomfort may be less strong next time. you could end up with bruising. 3) Slow-release Tretinoin cream (microspheres) is less suitable for this purpose but you can use it. It will sting less but it may sting longer as it is slowly releasing Tretinoin. 4) Vit. C does not have to be applied every day. Three times a week is enough. Apply oils or other products half an hour after vit. C. After Tretinoin, you can apply anything after five to ten minutes. For the rest you can apply oils or other products that you like as much as you need. I recommend our 0.05% Tretinoin cream. It helps keeping acne under control and it helps with post acne spots/pigmentation. Do not buy our Infadolan ointment for dermarolling aftercare because it could break you out but keep the treated skin moisturized with a cream that you know does not break you out. Keep on using your products for example. I suggest you buy a regular 1.5 mm dermaroller and a 1.5 mm dermastamp with 35 needles. When you are experienced with dermaneedling and when your dermaneedling tools get blunt, you can even try a regular 2 mm dermaroller and a 2 mm dermastamp. You can roll and stamp during the same session. First stamp the scars, then roll them. Since you have many scars, it is wiser to treat just one cheek (but thoroughly and densely). When it heals, treat the other cheek. Roll over the scars but avoid the areas that have pores and no scars, such as in your case right next to the nose part of the cheek. Your scars do not seem to be tethered so I do not think you need the suction pump but if your scars do not improve in eight months, add the suction pump. The problem is, that the skin on the nose reacts very unpredictably compared to the rest of the skin. Nasal skin can heal worse than you started with. There is no fat layer under that skin, there is only cartilage and that might be the reason. I think your scars will improve if you have patience and perseverance. Please let us know about your results (or lack of them). It would be very interesting to see your future results. If you obtain results, please post them here and we will give you some free products of your choice. Dermarolling / Microneedling / Re: Help with Dermaroller size and dermarolling essentials suggestions. Yes, every three weeks with the full length of the needles and for example every second day with just the tips to enhance the penetration of the product. However, apply hydroquinone or Ibuprofen (whichever you decide to try first) every day. I suggest you first try Ibuprofen because if it is a residual inflammation, it should work quite quickly and one box of ibuprofen capsules will be more than enough for one scar. Hydroquinone does not remove existing melanin. It only prevents the formation of new melanin so it takes a long time before you see results and if the pigmentation is not melanin, there will be no result. This is completely normal. Redness, mild swelling, itchiness, dryness and tenderness are normal reactions. In some, these reactions last just hours and in some they last two days. In case of aggressive treatments like single needling, they can last even longer. The longer the needles the longer it lasts. After dermarolling, wash the skin with tap water, let dry and apply Infadolan. Apply Infadolan until the skin is back to normal and even after that, keep it moisturized with a cream of your choice. If the skin reactions are very unpleasant for you, make the gaps between rolling longer than eleven days. Thank you very much for your update! I know what you mean. It is very difficult to do before and after photos from the same distance, angle, with the same light conditions etc. I think your left cheek has some nice improvement. On the before photo of the right cheek, there are still unhealed crusts from acne that unfortunately later healed as scars (you can see these scars on the after photo). I hope it will improve if you continue with your treaments. In your case, I would also add a 2 mm dermastamp. In case of stubborn scars, it is worth trying various approaches. I have emailed you a few days ago but I haven't received a reply.. Yes, every 10 to 14 days with the 1 mm size. Dermaneedling works without any creams but the creams help establishing good conditions in the skin for collagen production. The skin on the knees is very thick and a 1.5 mm size is appropriate. Also, you should not use the same dermastamp on your face and on your knee because the tough scar tissue on tough knee skin will make the dermastamp blunt sooner and you need a sharp dermastmp for your facial scars. Concerning the hyperpigmentation and Ambi cream, it depends what is the cause of the pigmentation. Sometimes, it is residual inflammation. Try this: buy a non steroidal anti-inflammatory such as Nurofen rapid capsules (it contains ibuprofen). For sale in pharmacies (OTC). Prick the capsule and apply some of it at least twice a day on the pigmentation. It may sting. And sometimes it is overproduced melanin pigment. Melanin is skin pigment that is normally present in the skin but unfortunately the skin often reacts to skin injuries by overproducing the pigment. Even very small skin disturbances, like a bug bite, can in some individuals result in the overproduction of melanin in that spot. What helps then is Tyrosinase inhibitors such as hydroquinone. They inhibit the enzyme that converts tyrosine to melanin. Ambi fade cream contains 2% concentration of hydroquinone. Use your dermastamp to enhance the penetration of hydroquinone or the anti-inflammatory but do not insert the full length of the needles for that. Just the tips so that you prick the outermost layer of the skin. Once in three weeks, stamp the scar with full length of the needles to crush the scar tissue. It can also be a combination of residual inflammation and melanin overproduction. What often helps (in both cases) are products that speed up the turnover of the skin - mcironeedling, acid peels, Tretinoin cream etc.